A single camera is situated inside the Nintendo 3DS and two cameras are mounted on the outer shell. Built-in software programs include Nintendo 3DS Sound, Mii Studio, a selection of augmented reality games for use with the AR cards, and more. 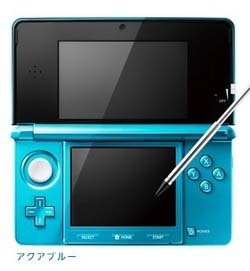 The battery life of the Nintendo 3DS stands at 3.5 hours for 3DS games and 5-8 hours for standard DS and DSi software. Please note that the Japanese Nintendo 3DS is compatible with all Japanese DS, and DSi games but can only play standard DS games from the United States. If you attempt to play a USA DSi or 3DS game on a Japanese 3DS, you will receive an incompatible warning message. To reiterate, the Japanese Nintendo 3DS is region-locked so it can only play Japanese 3DS game cards and software downloads. Please take note of the region limitation before considering an order. Thanks.